I was this young, skinny kid walking around in Bally’s Total Fitness (remember those?) back in Warren Michigan. I was on a desperate quest to build muscle and achieve serious #gainz. Like most young, naive men I looked to find a gym mentor. When deciding on a mentor, I cared far less about formal education and scientific reasoning and I put much more merit into the sizes of the mentors biceps and the amount they could bench press. Mike was an awesome dude and very cool guy who took me under his wing for a bit. Mike had a PhD in bro-science and was willing to impart on me all of his extensive knowledge. One thing my bro-fessor Mike taught me was to NEVER miss my post workout protein shake in risk of losing all of my hard earned muscle I just created in the gym. Makes sense right? Mike was swoll, and I was not so I was going to blindly follow every piece of advice he gave. Fast forward to today and I laugh at my past experiences with my bro-fessor. Mike meant well, and I am appreciative for all he taught me. But today I know better and the science of building muscle goes against most of the myths that still exist in the gym. The following list is the four myths I hear the most in the gym and I have a fun time debunking them for you so you don’t fall into the traps of a bro-fessor like I did. 1. You do NOT need a protein shake after a workout. I hear all the bro-fessors and GNC sales reps out there yelling at me for this one. Sorry fellas, it’s just not true. 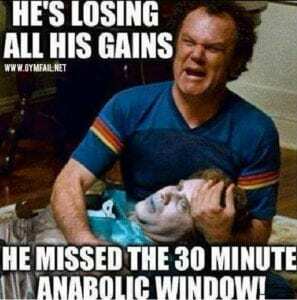 Alan Aragon did a great job discussing here that we just can’t prove if there is an anabolic window or not after a workout. However, it’s safe to assume that if you consume adequate protein before a workout, that you will be fine for hours after a workout and do not NEED a shake immediately after. In most cases, and immediate post workout shake is redundant. Now, if you train fasted (which I don’t recommend in the first place) then having an immediate post workout protein shake plus carbohydrate makes sense. As always, this answer is dependent on the individual and the circumstances. For most, having a post workout shake is not a requirement if you nail your pre workout nutrition. I give detailed pre-workout nutrition recommendations in this video here. In terms of post workout nutrition I usually have my clients have a whole food meal within 60-90 minutes after training which contains a lean protein, starchy carbohydrate, minimal fat and fiber. If they are starving after their workout and enjoy consuming a shake I don’t stop them. It’s just not a requirement. As always, personal preference dictates meal timing for my clients. 2. You do NOT need excessive protein intake to build muscle. I remember as a kid watching a YouTube video of a bodybuilder saying to take in 3-4x your body weight in protein ONLY if you were serious about building muscle. Sounds like you’d be more serious about spending your time in the bathroom with GI issues based off of those recommendations. Adequate protein intake is essential to build muscle, but consuming more than you need will NOT yield more muscle. I set protein requirements for my active clients where it needs to be, and then I leave it alone. I do not increase protein over time, it’s just not necessary. So how much do you need? Current recommendations for active individuals from the Academy of Nutrition and Dietetics states 1.2-2.0g/kg of body weight for protein and I have found this to work extremely well. The Standard American Diet recommendations of 0.8g/kg is just not applicable for a lean and active individual. When would more protein be beneficial? When I have a client trying to obtain very low levels of body fat, and losing lean muscle mass becomes an issue because carbohydrates are much lower, then I may increase protein above this reccomendation. Again, it’s a case by case basis. For most people not trying to achieve an esoteric level of body fat, this is not necessary. If fat loss is your goal, you will not risk losing muscle if you are in a calorie deficit and have ample body fat to lose. Your body will prioritize the fat loss over the costly conversion of breaking down muscle to energy. Consuming adequate carbohydrates creates less of a need for protein because carbohydrates are protein sparing nutrients. So if performance and hypertrophy (aka #gainz) are your goals do NOT skimp your carbohydrate intake. 3. You do NOT need to be sore after a workout. As a personal trainer for so many years my clients would feel somewhat frustrated coming in for a workout if they were not sore from their previous session with me. I don’t know where this idea was created that you MUST be sore after a workout to indicate it was beneficial, but it’s just not true. First off, soreness is a result from the micro tears in the muscle induced by training and sometimes it takes about 24-48 hours to set in. This is termed DOMS or delayed onset muscle soreness. Soreness is an indicator of trauma, not progress. A lot of my clients weren’t feeling sore anymore because they had been training with me for years. So they had established a good baseline of progressions and their body had become adapted to the training. How did I know they were making progress in the gym? They were getting stronger over time. They were squatting more today, than they were six months ago. That’s what is termed progressive overload. As long as you are increasing your volume and your intensity in the gym gradually over time, then you are making progress and do NOT need to be sore after a workout. 4. You do NOT need to “shock” or “confuse” your muscles. This is probably my favorite myth to debunk because it’s just so silly. The term “shock” your muscle has it’s origin in marketing. This is a term used to get people to invest in some “revolutionary” training program that promises expedited results due to the fact that the muscles will be “shocked and confused” and thus grow faster than ever! Your body is smart, but your muscles are not cognitive life forms. They don’t have hopes and dreams. Therefore they don’t need to be confused. Stop wasting your time trying to switch things up every time you enter the gym and focus on progressive overload. If you squat 135 for 3 sets of 10 reps today, then next week try to get 12 reps. Then add 5lbs to the squat bar and achieve 10 reps again. Do this month after month, year after year and you will build WAY more muscle than trying to confuse your muscles in the gym. Building muscle takes time, and is a very slowly, tedious process. If you don’t have patience, this is not for you. For an experienced resistance trained client, the goal of building about 0.5lb of muscle per MONTH is a good pace. 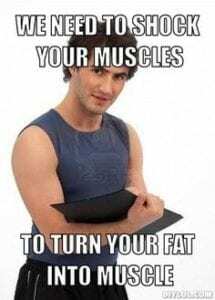 Oh, and you can absolutely not turn fat into muscle anymore than you can turn a tomato into an apple. They are two totally different biological compounds. Fat oxidation (burning body fat) and inducing muscle hypertrophy (#gainz) are two different chemical processes and should be prioritized differently. I ask my clients to pick the goal which is MOST important to them and we address that first. Trying to achieve both fat loss and serious muscle gain is not possible for anyone who has been training for a consistent period of time. If you found this post beneficial please comment and SHARE with any friend who is suffering the wrath of a gym bro-fessor.